Here’s your new favorite brunch item! Baked eggs. Anyone who knows me knows that I do not actually like eggs in their purest form. Runny yolks are questionable, don’t get me started on hard boiled eggs, and scrambled eggs are good for approximately 3 seconds before they turn cold and sad. Omelettes are on my happy list because veggies and cheese can be involved, and quiche is a no-brainer because of the crust, clearly. However, I’m always on the hunt for ways to use eggs that I do like, because they’re cheap and a great source of vegetarian protein. 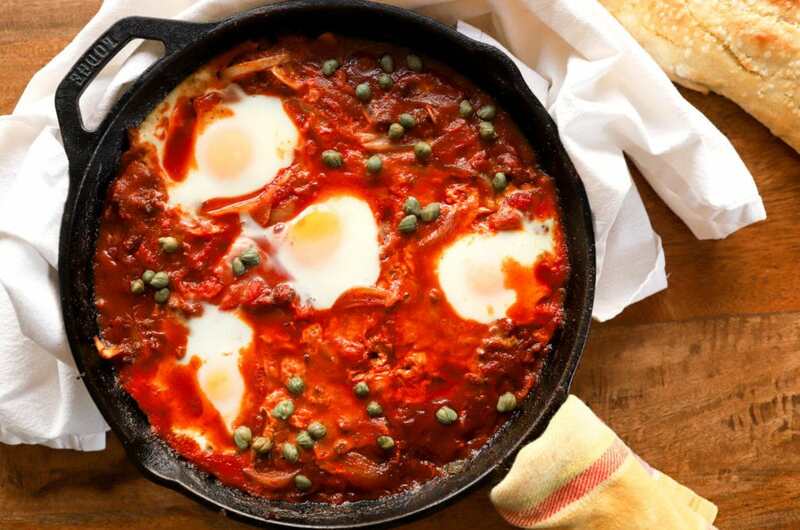 Obviously I added pork to this so we are NOT left with a vegetarian dish, but what we end up with instead is something similar to shakshuka, a Middle Eastern baked eggs dish that I’m super into finding pictures of on the internet because the combination of flavors and textures and colors is just so pretty and appealing to me. 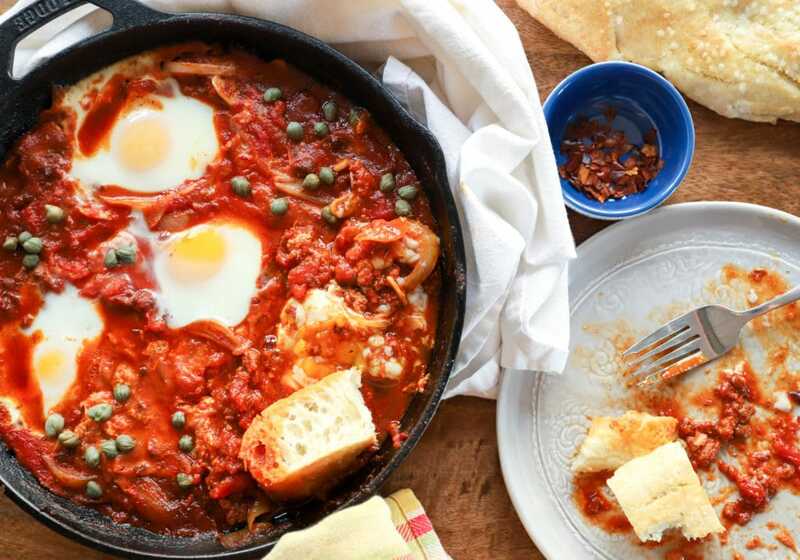 Tangy sweet tomatoes, creamy eggs, garlic + onion, and I started with chorizo to bring extra savory flavor to the party. Bread for dunking is a must, mimosas would be perfect for a brunch. 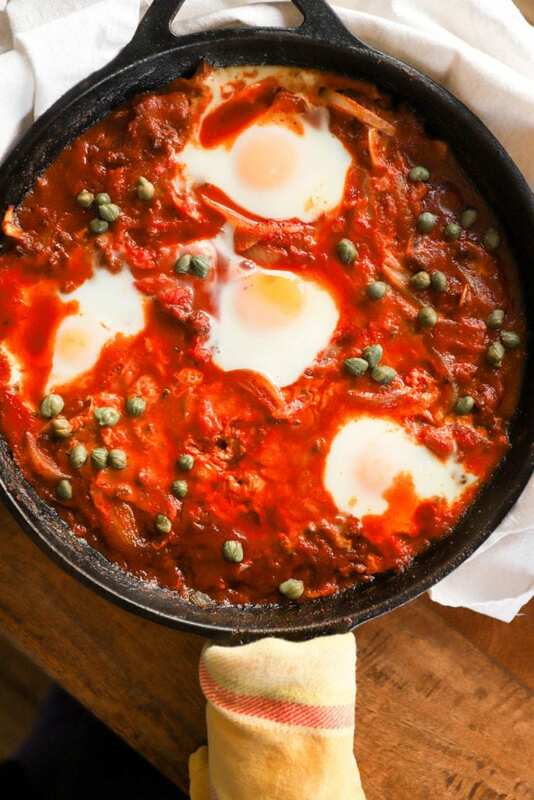 If you serve this for a morning situation, I love that it can alllllmost be made in advance; make the tomato sauce, leave it (covered in the fridge) in the skillet overnight, then crack the eggs into the skillet in the morning, bake the eggs, and brunch! I have a few fun weekend-morning events coming up, and I’m thinking this would be perfect for a shower or early-in-the-day birthday party, right? Start with browning the meat in the skillet you’ll use for the entire dish – cast iron is great, or anything you can put into the oven. 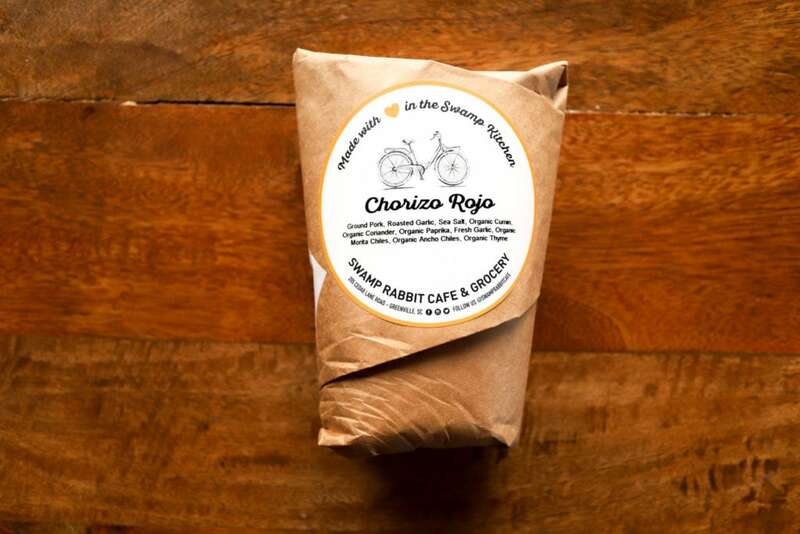 I use this bulk chorizo from our favorite local grocery store, but any chorizo or even sausage is fine, just take off the casing if it comes in links. Brown the sausage over medium-high heat until it’s browned and crumbly. While the sausage is working, gather up the super simple other ingredients. 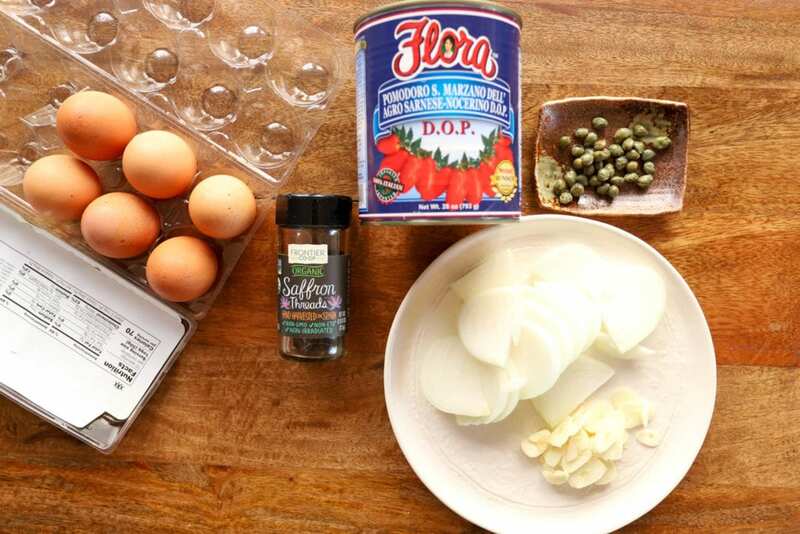 Sliced onion and garlic, saffron (skip it if you don’t have it, no need for a wild goose chase), canned diced or crushed tomatoes, eggs, and capers. You can use as many or as few eggs as you’d like depending on the crowd you’re serving. When the chorizo is cooked, add the onion and garlic and stir the veggies into the chorizo for about 3 minutes to soften them, then add the tomatoes and saffron. 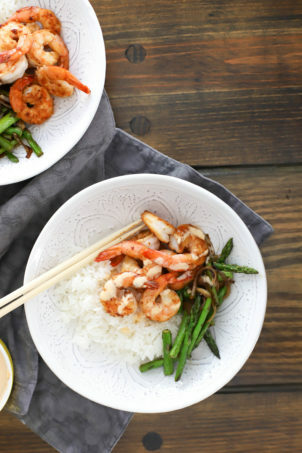 Stir to create a sauce, then taste – add lots of salt until the sauce is very flavorful. At this point, you can leave the sauce for later or turn the oven to 350F if you’re ready to bake the eggs. 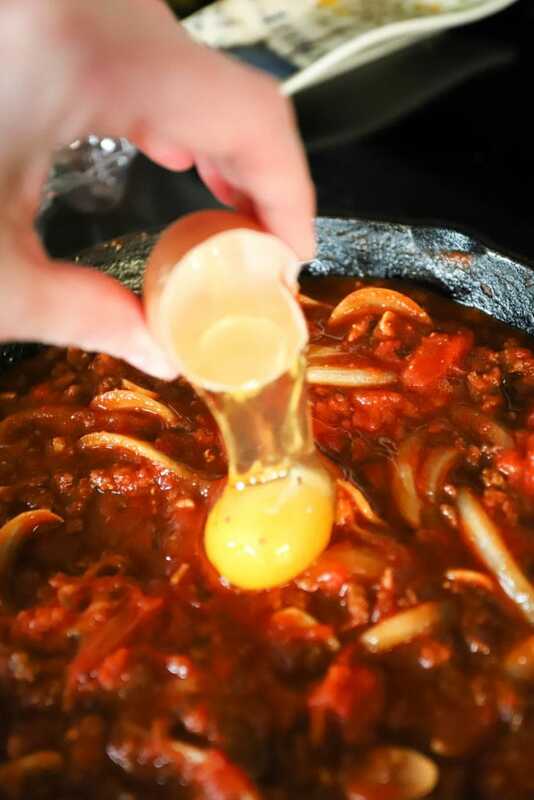 Make a little well in the sauce and carefully crack the eggs into the sauce so they rest right on top. 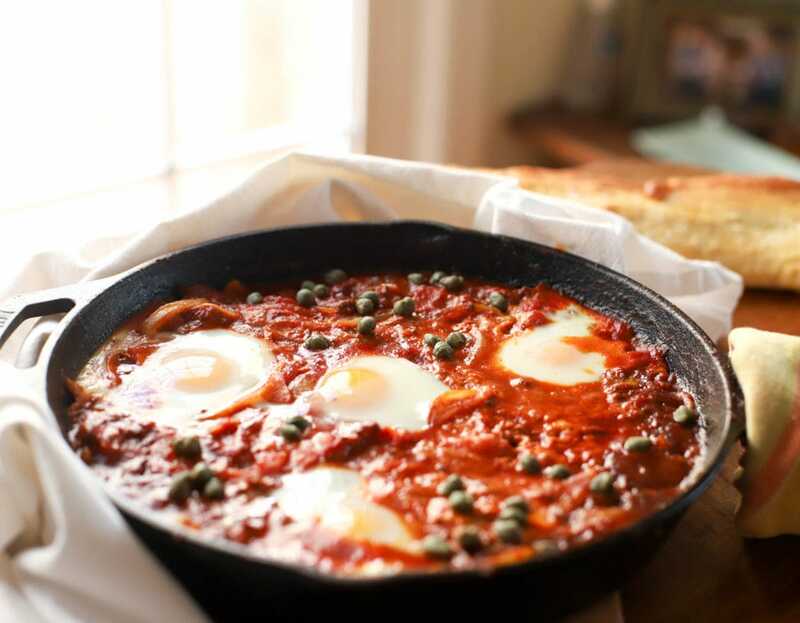 Right when you take the skillet out of the oven, sprinkle the capers over the sauce so they get nice and warm. 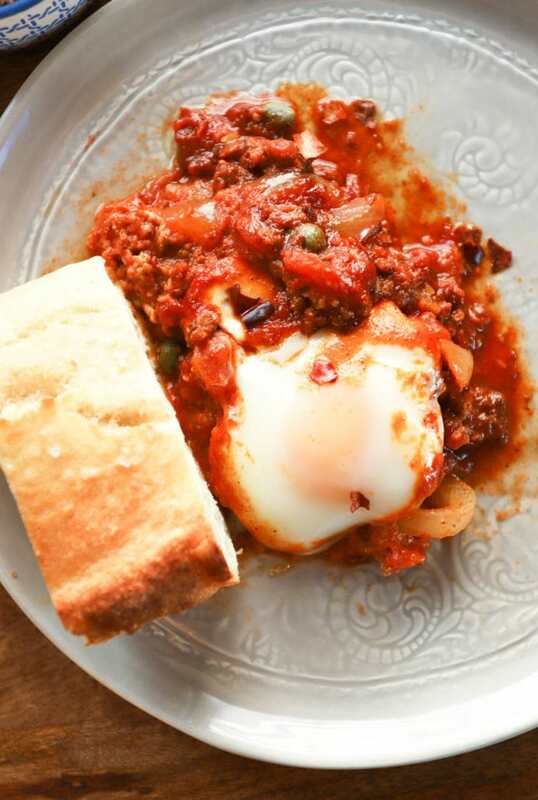 Sauce + runny egg + bread = I’m a believer. The sauce here is so good, slightly floral from the saffron and tangy + spicy from the chorizo. 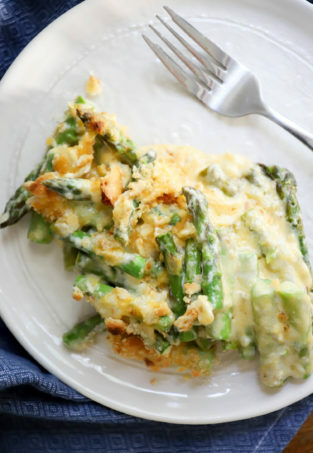 The eggs smooth everything out and add another protein punch to this – a great option for people who are doing low-carb, just skip the bread and this is still plenty filling. 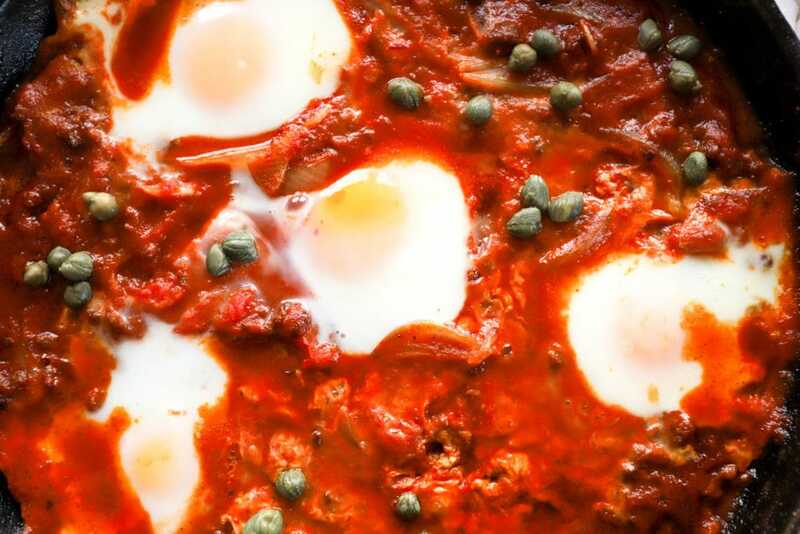 This works for any meal of the day, but the warm sauce and eggs feel especially cozy for a breakfast/brunch situation on a cold day, right? It’s supposed to get cold here again this weekend, so this is my plan. Saturday is only a million tasks away – we can do it. Enjoy this! 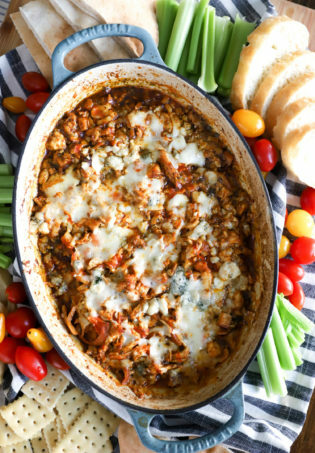 Preheat the oven to 350F and a large ovenproof skillet to medium-high heat with a drizzle of olive oil. 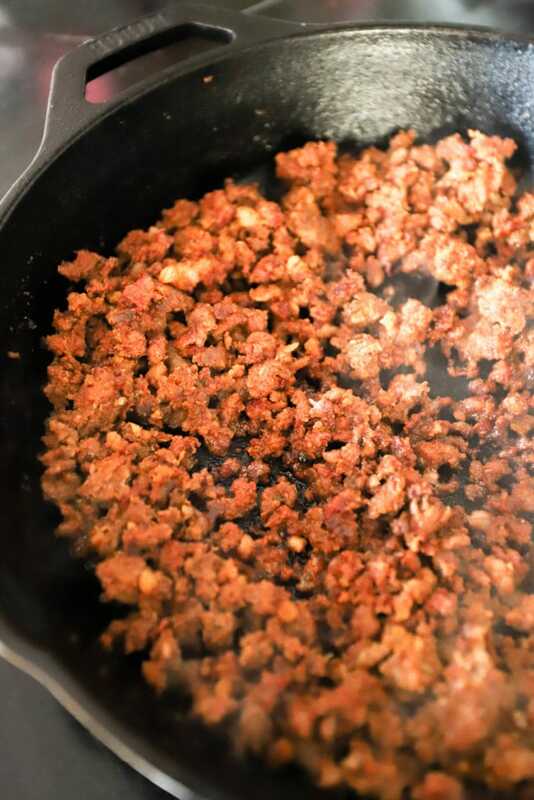 Add the chorizo to the skillet and brown for 7 minutes or so, breaking it up with a spoon as it cooks. 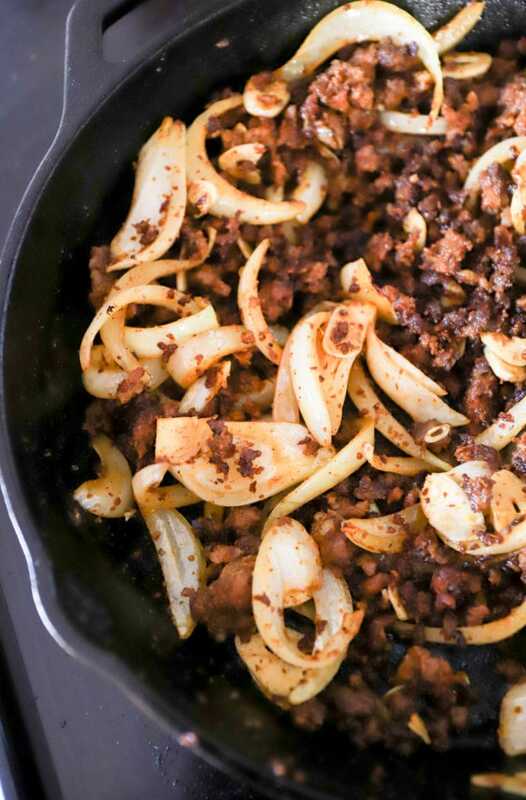 When the chorizo is cooked and browned, add the onion to the skillet. Stir the onions into the chorizo for 3 minutes. Add the garlic slices and cook for one minute. Add the tomatoes and saffron threads to the skillet with a sprinkle of salt. 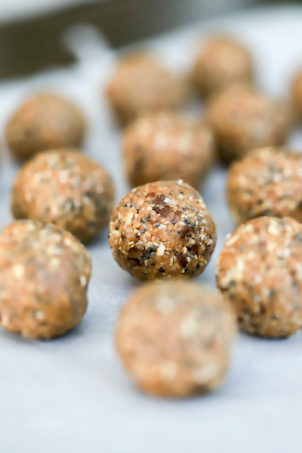 Stir to combine and taste; add more salt to your preference until the sauce is very flavorful. 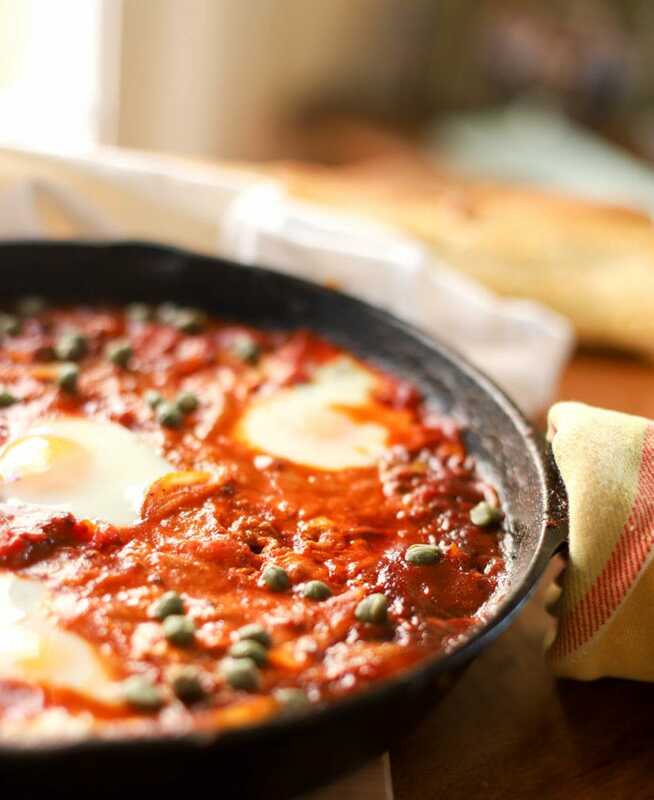 Make little wells in the sauce and carefully crack the eggs into the sauce – try to keep each egg together and don’t stir the sauce after this point. 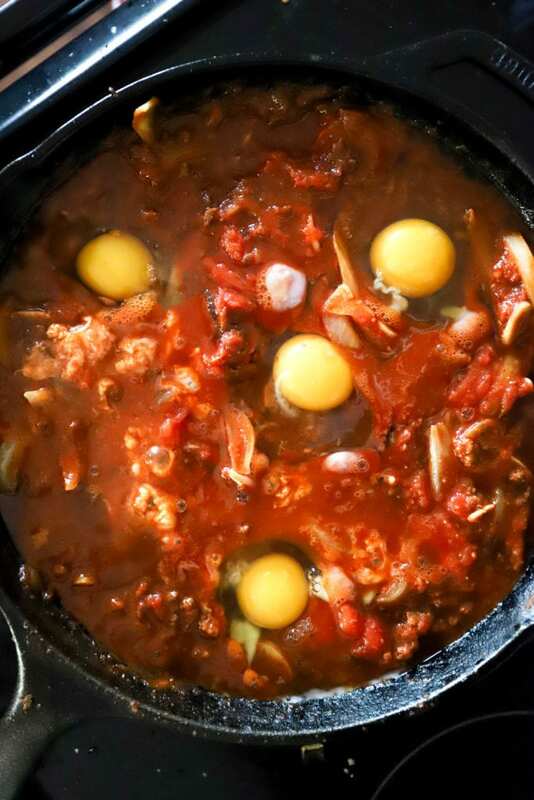 Place the skillet in the oven and bake for 10 minutes or just until the eggs are set and the yolks are still soft. Sprinkle the capers over the dish. Let the sauce cool for about 5 minutes in the skillet, then serve with bread and crushed red pepper flakes. Enjoy!